Most of us still haven’t even completed our Christmas shopping, as famous brands and labels are still pushing gift ideas for the season’s holidays, while Just Cavalli is already stepping out of the Christmas mode and is launched into the near future. Getting head start on everyone else, Just Cavalli has presented a special jewellery collection for the most romantic day of the year, Valentine’s Day. Teaming up as usual with the Morellato Group, who is currently the world leader in the design, manufacture and marketing of jewellery and watches (they license not only Just Cavalli, but also John Galliano, Maserati and Miss Sixty), the Italian luxury fashion brand has launched a new and eye-striking jewellery collectionfor the young and modern woman. The new capsule collection, especially made for Valentine’s Day 2014 has been dubbed Just Neon. The Just Neon collection is a dazzling and youthful mix between high class looking jewellery and Roberto Cavalli’s young, free spirited and highly distinctive fashion line. This new collection is just for women and features delicate dangling earrings, charming bracelets, and fine and delicate necklaces made from sterling materials and decorated with clear or colored stones. Design wise, this new collection does not stray very far away from Just Cavalli’s 2013 Fall and Winter assortment of jewellery. Just Neon collection is available in two different versions: the first version features more classic and glamorous designs in silver or gold plating or with pvd steel. The second version is decidedly more fashionably trendy and lively looking thanks to the captivating and enchanting colored stones that come in either shiny amethyst purple, jade green or periwinkle blue colors. 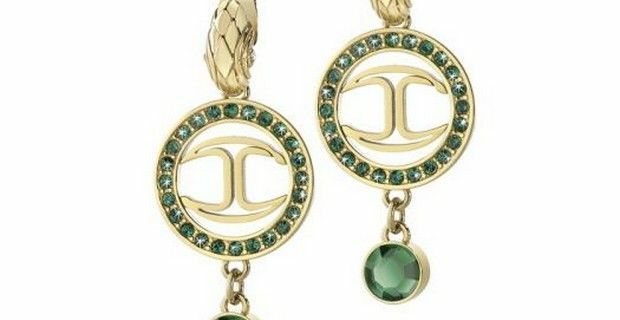 Just Cavalli’s high end fashion jewellery is crafted from stainless steel and/or aluminum, and the Just Neon collection is also characterized by the attractive charms and pendants that feature the world famous Cavalli logo.